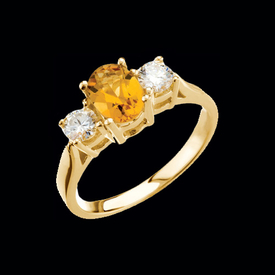 Gorgeous 14k yellow gold citrine and diamond 3 stone design ring. 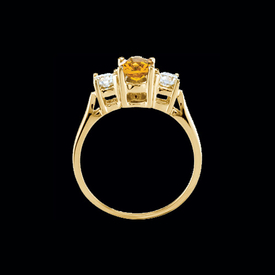 This ring features a 7x5mm oval AA quality faceted citrine center accented either side with a genuine 3.8mm round diamond. Diamonds total 3/8ct tw. Stock size 7. We are happy to size this ring up or down 1 size free of charge. Custom sized items are non-returnable.